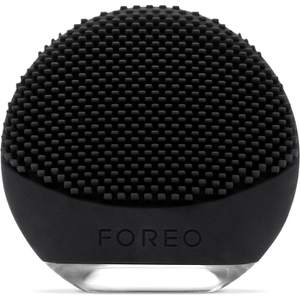 Treat and transform skin with the FOREO LUNA™ 2 for Men, designed to cleanse skin whilst prepping for a superior, smooth shave experience. Inspiring healthier-looking skin, the LUNA™ 2 will help clear and clarify for a more luminous complexion whilst preventing razor burn and irritation. Combining T-Sonic pulsations with newly designed touch-points, the device targets skin cells gently yet efficiently, helping to unclog pores and lift away dirt and oil; its flexible brush adapts to contours of the face for closer cleansing. The silicone 'bristles' are super hygienic and resist bacteria build-up to keep skin fresh and clean. Embedded with a high-technology Anti-Ageing Mode, the cleanser directs lower-frequency pulsations to wrinkle-prone areas to help smoothen lines for firmer-looking skin. 1 Apply Cleanser: Apply your regular cleanser. Wet the LUNA™ 2 for MEN and activate its Cleansing Mode. 2 Cleanse: Move the LUNA™ 2 for MEN’s cleansing surface in circular motions over your face for 1 minute. 3 Rinse: Rinse and dry your face. Shave, if desired, then apply any additional skincare products. 4 Anti-Ageing: Activate the LUNA™ 2 for MEN’s Anti-Aging Mode. Press its anti-aging surface onto wrinkle-prone areas for a total of 1 minute. This brush is great. I use it twice a week maybe, when I shave as the shaving is so much easier and smoother. My skin also looks firmer after. My girlfriend noticed it and I never said anything. My wife bought this for me, brought it home and made me use it which I hated at first. Now that I have seen that shaving is much easier, I happily use it too. It also has the anti-ager within its options and it is brilliant. I will continue on using it! I will definitely continue on using Luna 2 because it is very good product with great design and even better performance. My beard is never completely shaved off but I do understand that the deep cleansing contributes to easier shaving. I bought this product as a gift for my husband. He used to get lots of bumps and this thing helped him to prevent it. After a month, his skin was dramatically improved. It is great that is waterproof, so he can use it in the shower too. He is really impressed with this product, and I am so happy that I bought it. I use it twice a day for two minutes. It provides really enjoyable treatment. I love the pulsations, they are very relaxing. It works fast and makes my skin wonderfully soft and clean. My face looks great. Simple, very efficient and easy to use. That is all this product means to me and it helps me a lot. Once in a while I had to get facial massage but now I do it on my own and I CAN’T EVEN DESCRIBE THE DIFFERENCE! My face feels more relaxed and it looks healthy. I’m feeling this change all over my body. Besides, I don’t have to pay so much to visit SPA centers anymore. Excellent job!